It doesn’t have to be this way…. A day when six FIFA officials were consulting their lawyers about how they will undoubtedly wriggle out of charges leveled against them and the “Capo Di Capi Tutti”, Sepp Blatter was being elected President of FIFA. Against a background of bribery allegations and a horrific death toll among the immigrant workforce building stadia for the 2022 World Cup in Qatar no one would blame anyone who turned their back on the game of football. As my phone bleeped to advise me of a Guardian newsflash that Blatter had been reelected I was standing in a queue to get on this bus. In the Moston area of Manchester, a club born of frustration at many of the values held dear by Blatter and his corrupt cohorts was playing its first game at its own home against an illustrious and world famous football club. This was FC United Of Manchester, a club founded 10 years ago by disaffected Manchester United fans over a Chicken Tikka Massala and a couple of Peshwari Naans. 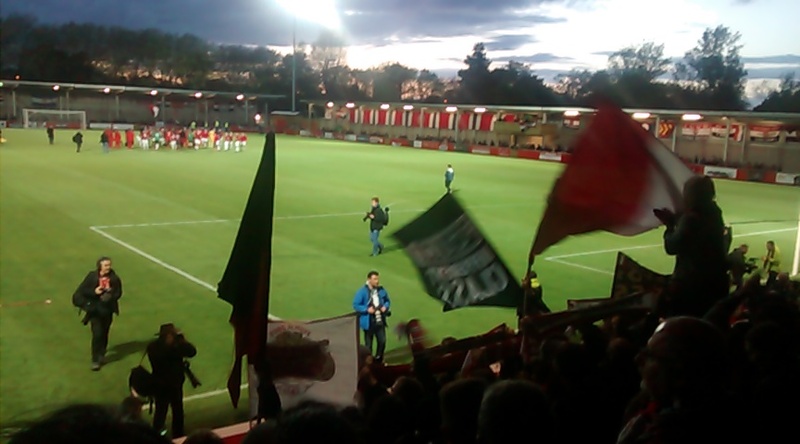 Founded on the principles of one member, one vote and owned wholly by the fans played their first match at Broadhurst Park against Benfica, the club that 47 years earlier United defeated to become the second British Club and first English Club to win the European Cup*. In truth I wouldn’t forgive anyone for complaining about the coverage that FC United have received in recent months. Their promotion to Conference North, putting them two steps from the Football League and the new stadium opening has meant a raft of articles and coverage in national media. I’ve written a couple of blogs of my own about the club which were more akin to love letters than objective observations so I’ve done my bit to add to the “narrative” of FC being some kind of football utopia. I thought on this visit I’d keep one eye out for bandwagon jumpers, jester hat wallopers, Sankt Pauli T-shirt wearing hipsters and, “Worst In Breed”, the Lovejoys. 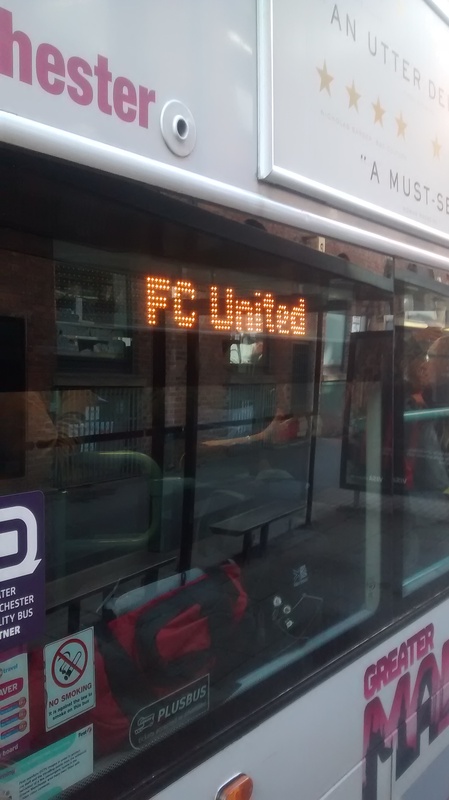 The bus I boarded in Manchester city centre was one of a number of free buses laid on to take fans out to the stadium. I was told that this may be a regular thing next season as the club has a desire to reduce the traffic impact to the local community on match days. This could be nonsense but I couldn’t help but think it sounds the sort of thing that they would do. On the bus I struck up a couple of conversations. There was a woman taking her 13 year old to his first FC game when he was of an age to remember it (she used to take him when the club was first founded). She was keen to expose her son to this sort of experience rather than the more corporate match day on offer at Old Trafford. This threw up what is possibly the biggest problem that some have with FC, the fact that there are many in the support who do go to see FC yet still go to Old Trafford. She admitted that she still goes to see United whenever she gets the opportunity and her son has been, again when the opportunity arose. So what is going on there, can you do both? In short the answer is yes. Everyone I have spoken to has said that the love they have for Manchester United is not something they could turn off, some among the support have never been back but will still watch the games and they celebrated the recent victories over Liverpool and City in the same way they have their whole lives. I’m sure that explanation isn’t going to convince anyone, in fact, writing it I can see how you could drive a bus through it, it doesn’t stand up to even the most basic examination. How can you be a fan of two clubs when one was set up in part as a protest against the owners of the other? On to the match experience itself. The plan was to have a couple in the Miner’s Club a couple of minutes walk from the stadium but for obvious reasons this place has already become the natural rallying point for what would probably be called the Ultras, and a great bunch of lads they are. Utterly committed, politically switched on, funny and one in particular is a demon for a good skin care regime. Despite a dry run a week earlier it was clear the club wasn’t expecting the numbers so I decided just to hop across to the stadium. I’m glad I did. The whole place was just buzzing, the feeling of pride on what has been achieved was palpable this is where it dawned on me this wasn’t a passing fad for the majority there is a deep sense of “I did this”. I sensed it stemmed from the concept of everyone being a co-owner with the one member one vote principle at its core. The game itself was secondary to the occasion. Benfica sent across their B side and their quality was there for all to see. Despite the fact that FC hadn’t played a competitive game in weeks they gave a fine account of themselves losing out to a late goal. On the terraces it was business as usual, 90 minutes of raucous support, with people finding their place in the ground that they will call home in the coming seasons (halfway up terrace behind goal to the left as you look at the park for me) There were still some teething problems with bar facilities but that will resolve itself after a couple of games and with decent prices (a tenner for two bottles of cider and two lager) then getting along to the ground early isn’t going to be an excuse for getting fleeced as it is at most places. I mentioned earlier that I intended to keep an eye out for anything negative in the support and mebbes it is through red coloured specs but with only a couple of exceptions it was a reassuringly positive experience. The exceptions I spotted in the second half when I needed to nip down to the loo. Down there I saw a few people standing under the terrace having a beer, I know a couple of them from the pub where I watch United games and talking to them they said they were just along with a few mates for the carry on. It was clear that they are unlikely to be regulars at Broadhurst any time soon. 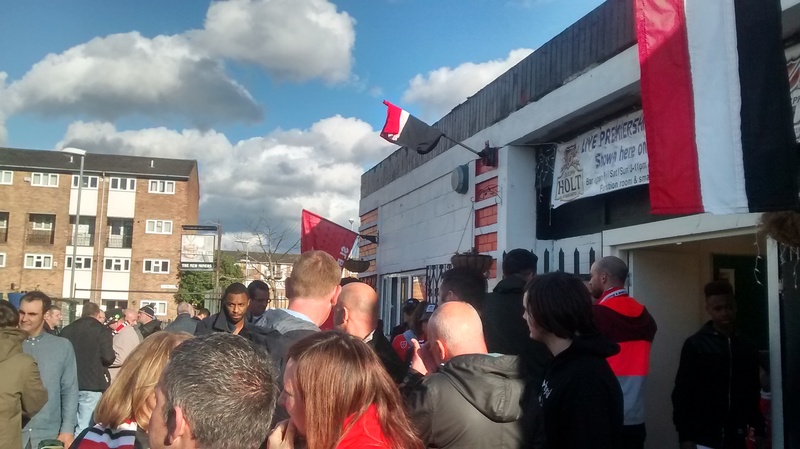 I make no apologies for this being yet another FC United love letter, as I said above I totally understand those who look at the club and have that “too good to be bloody true” feeling about it. What I would say is this, get along to a game, get along early, go to the Miner’s club, stand behind the goal and just go with it. You won’t have had a better matchday experience in many years, I promise, especially if your normal team of choice plays or has played in the Premiership. *The first British club to win the European Cup was, of course Glasgow Celtic…. 1 Response to It doesn’t have to be this way…. Enjoyed your recent FC blogs Jim, and as a regular for past 2 years I recognise the feelings that were re-awakened in you from your 1980s match-going experience. 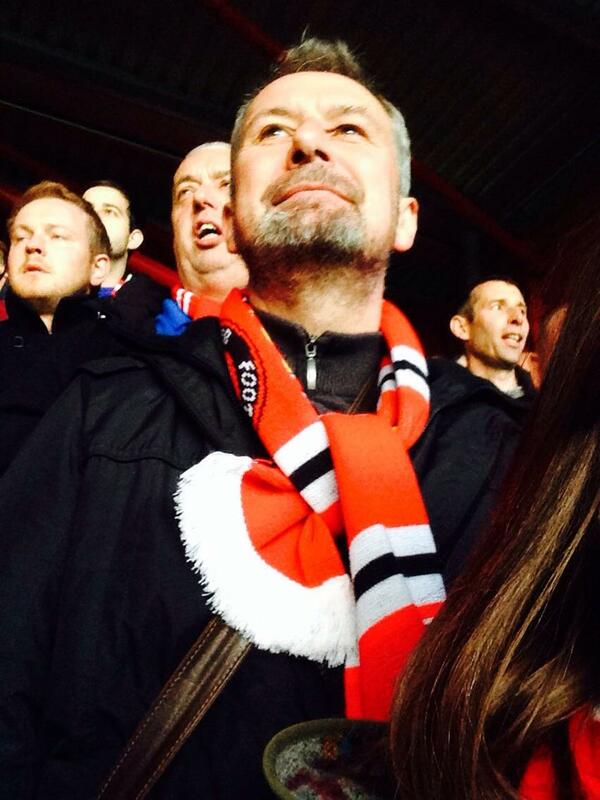 I’m a Red, always will be, but haven’t paid into Old Trafford since 2005. My Mrs is a Blue, but the idea of being able to take our lad (9) to a PL game is preposterous due to the planning and costs involved. 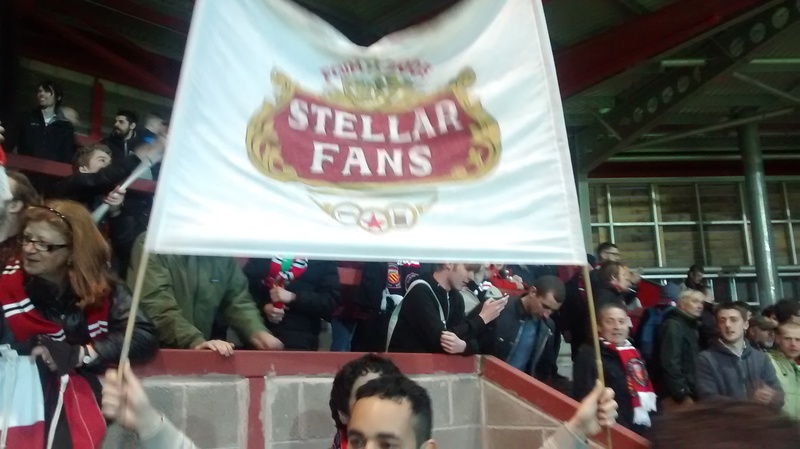 We all come together under the FC United banner and share a tiny part of a thrilling journey. I just make sure I don’t sing any anti-City songs on the terrace and we’re fine! Roll on next season, and I may see you at Broadhurst. All the best, Stu.